As soon as we entered our pazar in Beşiktaş, we saw them in a pile at one of the first tables. I nearly shouted with joy. Kanlı portakal (blood oranges) are back in season! I love blood orange season almost as much as I love nar (pomegranate) season. Lucky for me, both fruits are available around the same time every year. How could you resist walking by a stall selling these sunset-colored oranges? In fact, blood oranges seem to have arrived slightly earlier than usual. I normally find them at the pazar in Istanbul from February through early April. When a product first arrives at the pazar, the price is always higher. Only two stalls out of nearly 100 were selling blood oranges on Saturday. Thus, the price was set at 3 and 3.50 tl (about $2 USD) per kilo. Over the next several weeks, the price will decrease to 1 tl per kilo. Even regular oranges are 2 tl per kilo right now. We made our rounds stocking up on fresh produce such as lettuce, tomatoes, cucumbers, carrots, mandalina, roka (arugula), onions, ginger Brussels sprouts and broccoli. Since we didn’t see any other stalls selling blood oranges, we returned to the entrance and purchased just one kilo of blood oranges. I’ll wait until the price decreases to buy more. On Sundays at home in Istanbul, my husband turns into a juicing machine. I help rinse off and slice the fruit while hubby uses his manpower to operate our crank juicer. We find it easier to do all the fruit at once and store the juices in the fridge to drink throughout the week. It’s a messy job as juice splatters everywhere on our white kitchen counters. I often have to bleach out the blood-red nar spots. Hubby juiced the blood oranges yesterday at home. Yesterday, he juiced 4 kilos of nar, 3 kilos of oranges, 1.5 kilos of lemons and 1 kilo of blood oranges. Meanwhile, I used the lemon juice to make a batch of my ginger syrup so we can have homemade ginger ale at home. Maybe I'll also make some blood orange sodas this week. Our fridge is always full of strange concoctions in glass jars such as limonata mix, strawberry vodka or candied lemon peels. Left to right: blood orange juice, ginger syrup, limonata syrup, orange juice and fresh pomegranate juice. This morning, I’m having a karışık glass of nar and portakal juice for breakfast. What’s your favorite winter fruit? I have just recently moved to Istanbul and love reading your blog! I love fresh fruit juice- have been enjoying nar and portakal very much but don't have them as often as I would like because it seems like such a lot of effort- but I was intrigued to read your post that you make juices to keep all week long. I often find that the flavor of the juice changes after even a few hours let alone days. It would be great to know if you had a secret that would enable me to always have some fresh juice on hand. i love blood oranges. and homemade ginger ale is the best! I love your blog! I am a Turkish citizen living in the US for the past ten years and one thing that I miss most from Turkey is cheap and good produce. I miss my pazars! Just a quick comment: you state that you juice them at once and keep them in the refrigerator. One thing my mom has been telling me that juices lose their vitamins in a few hours. I do not know whether there is any scientific evidence for that or whether it is just my mother talking but you may want to check that out. Agree with Zeynep - juices do lose their vitamins if they sit for days. Best to juice right before you drink. @Umbereen, Zeynep and Manya, I agree with you all in theory. Juices are best fresh. However, my husband gets up at 5:30 a.m. and leaves a lil after 7 to avoid the traffic and get to work early. There's no way I'm getting up with him to make him fresh squeezed juice every morning. So we store the juice in glass jars and make do with that. Juices can be frozen too. @Sara Louise, Thanks. Stop by anytime. 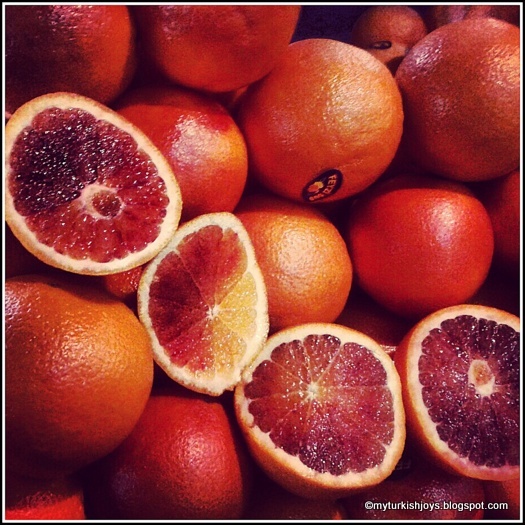 ;-)I just love the colors of blood oranges. I've yet to see any blood oranges here yet. Lucky you don't have a Turkish mother-in-law. I was accused of trying to poison the whole family by keeping pomegranate juice for just a few hours. @BacktoBodrum, Oh...I'm sure I'd be in trouble and scolded for many things if I had a Turkish MIL! :-) Like not always wearing slippers in the house.